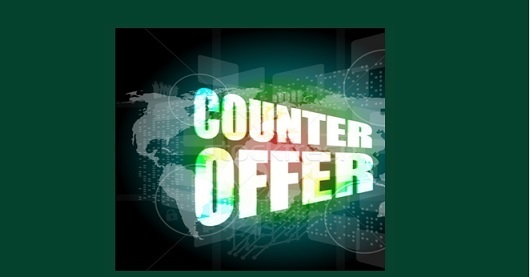 THE COUNTER OFFER - JOB-BORN Executive Search Inc.
You’ve been offered a new position with a company that will allow career growth, new opportunity, and more rewards for the contributions that you make. After careful deliberation and a lot of soul searching, you have accepted or decided to accept the new position. However, upon tendering your resignation, your employer asks you to stay. A meeting is held with you and your decision to leave is called into question. Emotional appeals are made to you to not break up the team. Proposals are made to make you reconsider your choice to leave. This process is known as a counter-offer. This is very common in a competitive marketplace but it can come as a shock to find that your decision is not being willingly accepted. Why are they suddenly trying to make you feel guilty about leaving and making all sorts of promises to make you stay? Why don’t they just accept that you’ve decided to leave and wish you well? Why are they making it so difficult for you? You can’t desert the team/your friends. We were just about to promote/raise you, and it was confidential until now. Why would you want to work for another company? Why didn’t you tell me you were unhappy? How can you just throw away what you’ve built here? I know what it is like out there, you won’t find another company like ours. The President wants to meet with you before you make your final decision. These discussions induce confusion, buyer’s remorse and cause you to second-guess your initial decision. The fear of change can surface. You are about to leave a comfortable job, friends, location, etc. for an unknown opportunity where you have to prove yourself all over again. Fear of change can influence your decision to stay. No matter how good the new opportunity is – it can sometimes seem more comfortable to submit to the pressure put on you to stay. These are common human reactions and counter-offer proposals focus on these sensitive points to change your mind. Why are they willing to raise your salary when you were not expecting a raise for some time? The reason is that when a resignation is tendered an employer can often obtain a quick fix by throwing money at the problem. Recruiters, employment advertising, training costs all affect a department’s budget. Why spend that kind of money when some well applied pressure might turn you around and solve the problem? It is much cheaper to keep you – even at a higher salary. Employers do not like to be fired. Employer-managers are concerned that they may look bad, and this could affect their standing because they are judged by their superiors partly by their ability to retain staff. When a contributor quits, department morale may be affected. Further, your leaving might jeopardize an important project, cause a greater workload, or affect the vacation schedule. It’s never a good time for someone to quit, and it may prove very time consuming to replace you. Some employers will actually tell you that your counter-offer is usually a stopgap measure because they couldn’t afford a defection at that point in time. The pressure of having to make a counter-offer can often affect the level of future trust between the hiring manager and the employee. While your employer may truly consider you an asset, and may genuinely care about you as a human being, you can be sure that your interests are secondary to your company’s interests. In other words, tempting offers and comments are attempts to manipulate you into doing something that is in your employer’s best interests, and not necessarily yours. Was it your next raise – just early? Will you be limited in salary growth in the future? Will you have to threaten to quit to get your next raise? If the department is so dependent on one person leaving, then the company has more fundamental operational problems and issues. You’ll likely not be considered a loyal team player again. You’ve demonstrated your unhappiness, or your lack of team loyalty. Many employers will remember this at the next review period, and trust, once broken, is very difficult to re-establish. Statistics show that the majority of those accepting counter-offers leave, or are terminated, within 6-18 months. Apart from a short-term solution and treatment, nothing really changes. The reasons why you started looking are still there. After the dust settles, the same problems very often reappear. You’ve committed to the new company, which has made plans and preparations for you. They are counting on you to act responsibly. Don’t sell out, or back out. Stand by your word. Everyone will respect your integrity. Look at the two opportunities, your old job and the new position. Which holds the most real potential? Probably the new one, or you’d not have accepted it in the first place. Remember why you chose to leave in the first place. When you are receiving emotional pressure to stay, it is easy to lose sight of the basis for your initial decision to leave. Why aren’t they respecting your decision? Your manager, to get to his/her position had to come from somewhere unless he/she was born, bred and raised in the company. In other words, people make career moves for their own reasons and not respecting your choice is the same as saying you have no right to choose to leave. When a manager says I don’t accept your resignation, what is being said is I don’t respect your right to freely choose where you go in your career. Don’t I benefit by getting the immediate change I want now? One last tactic used by employers is to refuse your standard two weeks notice and insist on three or even four weeks, explaining that it will take some time to find someone. When you have given your notice you have indicated your decision to leave and formalized it. Some employers take that as a challenge to get you stay – at least longer than the customary notice to have another opportunity to work on your resolve. Don’t let anyone persuade you off your chosen course of action. Two weeks is the accepted norm at all levels of experience. We’ve all been there at one point or another in our careers. Weathering the emotional pressure isn’t always easy. Keep the end goal in mind: positive new change and challenges. Don’t let anyone tell you directly or indirectly that you shouldn’t trust your own intuition and logic. They are your dreams and aspirations. Trust yourself. Mary Ann Warriner holds her designation as a Certified Personnel Consultant. She has over 25 years of hands on experience in attracting, motivating and retaining high-end professionals in all areas of Insurance, Having a strong understanding of how an effective recruitment function and management solutions can contribute to the success of an organization, She has a strong customer service focus and proven track record in building partnerships with management at all levels.